I want to share a sweet story with you about something that happened to me this last New Year’s Eve. It involves the coldest day of the year, a lost cat 3,000 miles away from me, and the way social media can connect us in the best of ways. I know that feeling of panic when a pet escapes, and I live in sunny Southern California where it never gets below 50 degrees! I immediately responded. Molly told me her cat Mickey had gotten out at about 7am and they’d been looking for him for hours. They’d been all around the neighborhood, calling for him, but with no luck. A cold front had moved in to upstate New York that afternoon and they were expecting -30 degree temperatures. She was terrified he wouldn’t survive the night. I had Molly send me a pic of Mickey to see if I could make a connection. I got into my psychic headspace and tried to get Mickey “on the line.” I was immediately able to get a connection with him and saw him under a porch or set of stairs, looking out at the snow. I told him that his mom and dad were worried about him and that he needed to come home. He said he was further away from home than usual. I asked how far, and he said about 10-15 minutes from home. I showed him that there was a warm house waiting for him and that his mom and dad were waiting right by the door for him, as Molly had told me. I told him night was coming on and it was only going to get colder as it got darker. He agreed and said he knew he needed to get home. I relayed all this to Molly, told her I thought I’d convinced him to come home, and asked her to let me know what happened. Mickey had come home! I was elated. I truly felt like I was given a gift to help reunite Mickey with his family. Fast forward a few months, and Molly asked if she could interview me about animal communication. She was kind enough to post it on her site, which you can read here. 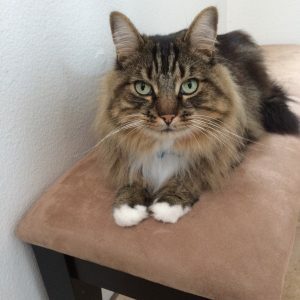 Animal communication is always rewarding, but this was an especially gratifying situation. 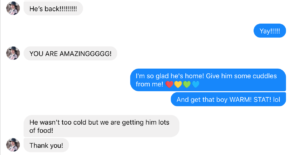 I’m so glad that I happened to be on Facebook that night, that Mickey was open to communicating with me, and that he made it home safe and sound.